When I was about 15, on the morning of School Photograph Day, something happened. Looking back on your time as a teenager, I'm sure you'll remember how significant having your School Photo taken was - and if you were unlucky, the sheer horror / disappointment in your ma's eyes when you got them back a few weeks later. You know, the moment when you unearth the big one [the one which is destined to be hung in Grandma's lounge for years to come] from its plazzy sheath to find that you looked like a mutant / had your eyes closed on each one. And Mum looks at you, like 'You little sh*t, I paid £30 for this set to proudly send out to the extended family and you looked like... that?!' And you die a little inside, knowing that your second cousins removed will now forever think you're some kind of stoner and / or gremlin. So for this catastrophe to happen on the same day as School Photograph Day was pretty soul destroying. On this day, I'd got up proper early and ironed my hair [literally, with my Mum's iron, to get it poker straight.] I'd already applied my lovely, biscuitty tan the night before, plucked my brows into oblivion and I'd spent many minutes applying my Mary-Kate & Ashley glittery coconut lipgloss. It was then that I made a decision which unfortunately affected my life forever. I curled my lashes with this pure dodgy £2.49 plastic eyelash curler from Wilkos [which my mate Gemma had highly recommended] and when I removed the curler, it had very kindly sliced most of them off. So I had a few lashes here and there - and then a massive block missing; which to me, pretty much symbolised the end of my life. Cheers, life. I never ordered a big version of that school photo, that's for sure. Since then, although my lashes have grown back, they've never been quite the same - and I've been reliant on big, fluttery falsies to get me through life. So when Kiy-oshi offered to send me some of their Eyelash Enhancer Serum* to try out, I jumped at the chance! The serum itself is safe, a non-irritant, fragrance free and perfect for women [and men] who have noticed the thinning, shortness or loss of their eyelashes. The serum works to enhance the appearance of your eyelashes by adding length, thickness and darkness - which sounded ideal to me, given the erm situation my poor lashes had endured way back when. Application is quick, easy and pain free, [I even took mine on holiday with me it's that convenient] slotting perfectly into your nightly beauty regime. The bottle has a tiny applicator brush-head to apply the serum. You simply dot this along the base of your lashes before you go to sleep each night, starting from the inner corner of your eye and working outwards. And if you're a contact lens wearer [like me] that's fine too - just apply the product after you've taken them out for the night, so you don't disturb it. I've been testing this product out for close to 12 weeks now, in order to give it a fair test. A lot of people notice a difference in their lashes within the first few weeks, but I didn't initially [probably because I kept forgetting to apply it regularly at first and kept falling out of the routine] so I wanted to give the product chance to work before reporting back to you guys. The rate your eyelashes grow and react to this serum is down to your skin type, too - so it's important to note that everyone's experience will be different. The first few times I used the lash serum, I was a bit sceptical [probs cos I kept forgetting to apply it!!] but once I had established a regular routine, I soon began to see a difference. As you can see from my Before and After shots, my lashes have begun to get their shine back - they're longer, softer and some of the more spikey and sparse areas [illustrated nicely in my Before photo] are fuller now. 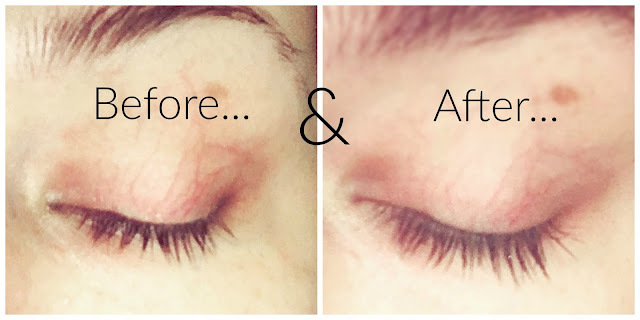 These are my natural lashes and I have no mascara or makeup on in these images, so you can see 100% real results. As it states on the packaging, this serum is a lash enhancer, not a miracle worker - so using it won't change your eyelashes overnight, but when I touch my lashes now, they feel considerably more strong and full - which is exactly the result I wanted. There has actually been a few times since using this product that I've rubbed my eyes and thought I'd forgotten to take my mascara off, due to the fact my lashes felt so much thicker and longer!! The most exciting part of trying out this serum is the fact that I have seen noticeable changes to my lashes in under 12 weeks. Can you imagine what long-term use of this stuff could do for me?! #LASHGOALS! Kiy-oshi do an Eyebrow Enhancing Serum too, to help sparse or overplucked brows grow out faster - so that's something else on my list to try, as 15 year old me wasn't exactly great with her eyebrows, either!! That school photo will haunt me for the rest of my days. Have you ever tried a lash enhancing serum? What do you think about my results using this one? I actually have another lash enhancing experiment coming up for you soon [I'm trying out a LVL lash treatment this week with Bloom Liverpool] so keep your eyes peeled for that! *This post contains items I was gifted for the purpose of review. However, all opinions are very much my own.